Sunday was a super laid back affair. I was initially worried that i had woke up late and would miss practice, but no one was too fussed about getting out on track. People were either recovering from the night before or just chatting to each other in the paddock. Eventually somebody thought it might be a good idea to get out on track and make some smoke. I wandered over trackside to have a look who was out practicing. Sam Holt, Mark Lappage and Rob Finn had joined forces to make a team. They were starting to look better and better. Then just as they had passed where i was stood there was a bang. Mark had had to slow to avoid Sam, but the moment Mark slowed was the moment that Rob initiated for the corner, there was nothing he could do to avoid hitting Mark. Both drivers were ok and luckily the damage to both cars was mainly cosmetic. 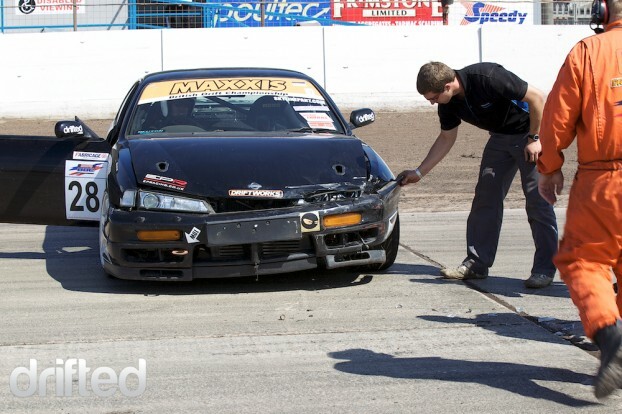 I saw Mark’s car at Japfest 2 this past Sunday, and if it wasn’t for the zip-ties holding the rear bumper together you could never tell it had been hit up the back. I did feel sorry for Rob as he had to drive his car back to Ireland. But this man always seems to have a smile on his face. This little incident would mean that the team would be named Crash bandicoots for the rest of the day. 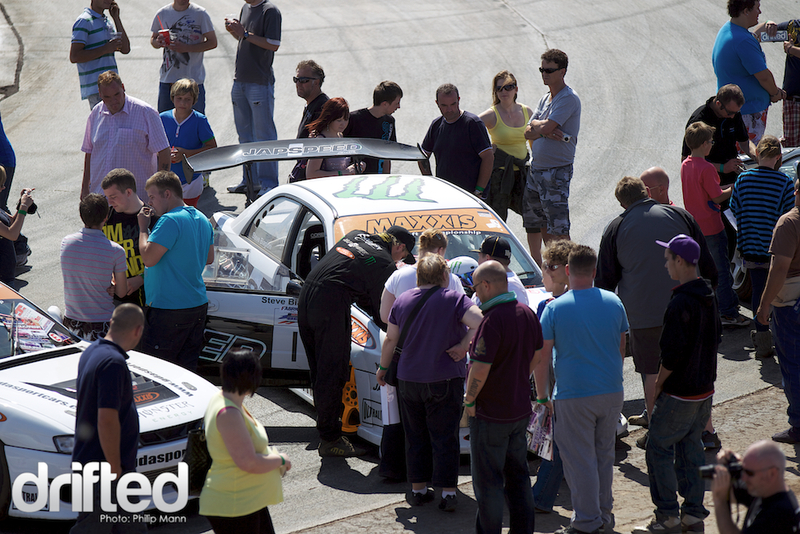 There was an impromptu driver meeting session for the public which seemed to go very well. Its something you don’t get with many other forms of motorsport. Hopefully it will encourage more people to participate in, or support drifting. 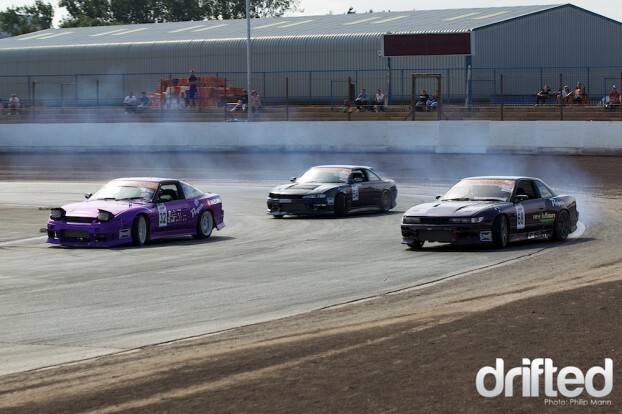 We went into qualification with 8 teams ready to do some triple drifting. 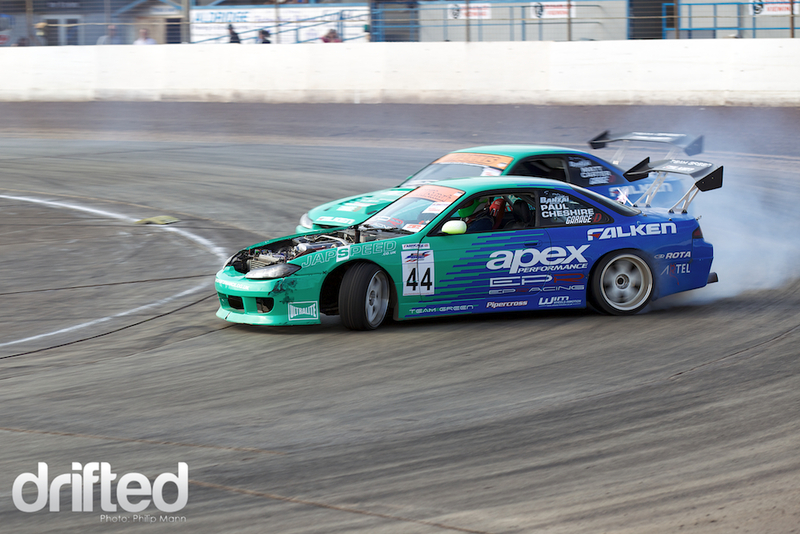 The team that everyone was looking forward to seeing, Team Green/Falken, suffered some bad luck. 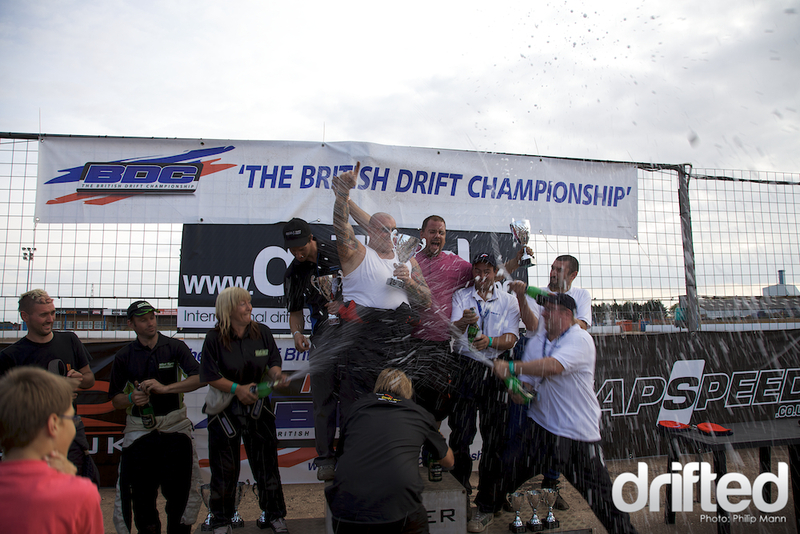 The 3 drivers got so close that Matt Carter and Paul Cheshire touched. 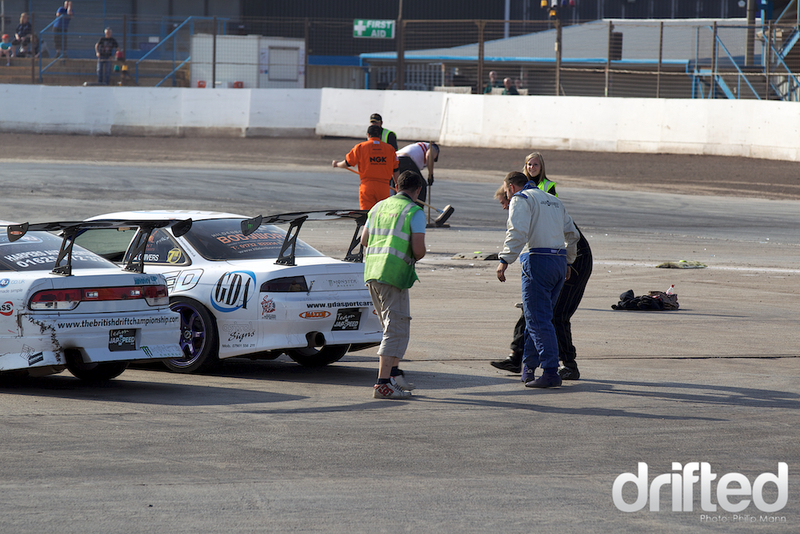 Matt had slowed to avoid hitting Alan Green, but the back of Matt’s car hit Paul’s front wheel. It spun Paul’s steering wheel in his hand so hard it broke his hand. I seen him at Japfest 2 walking around with a fetching green plaster cast on. But even thought he was in a lot of pain he carried on, and the team grabbed the top Qualification spot. Another team that had suffered bad luck was Team Launch. Only 1 of the 3 cars were competing, but they had been joined by Jordan Patton for the team event. 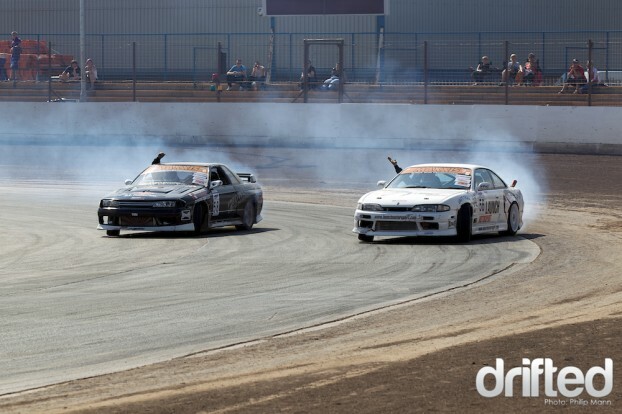 Team skyline owners only managed to qualify in 6th place after looking so good in practice. We kicked off with Team Mint against MPH customs. MPH put on a good show but could not match the runs put down by Team Mint. And just to give a good show for the public, Danni Murphy and Daniel O’Brien decided to kill their tires by doing some door to door doughnuts. Baggsy’s Subaru had broken down again so it was twin battles for Team Japspeed and Team Launch. Team Japspeed had an easy run against Team Launch. 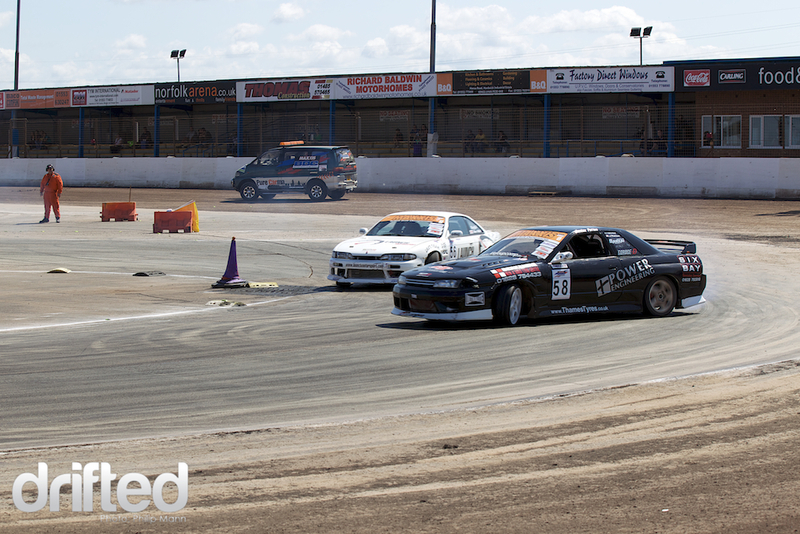 Team Launch did a bit of showboating round the last corner but couldn’t score enough to put Team Japspeed out. Team Scream were up against Skyline Owners. 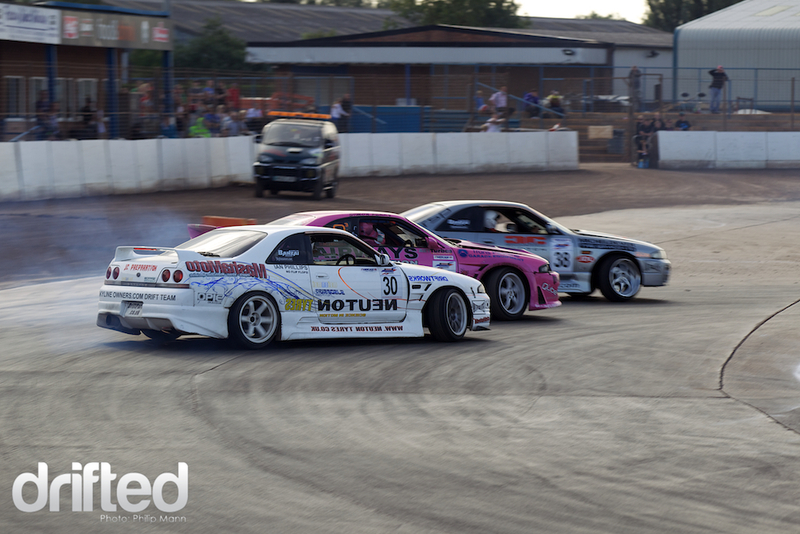 Skyline Owners must of been takeing it easy in the morning as they looked very good against Team Scream. They came out of the final corner really close with their arms out the windows. But more bad luck was to befall Team Green/Falken, Alan Green’s turbo decided that it had had enough and killed itself. This left the wounded Paul and Matt to carry on. You couldn’t tell by watching the runs that Paul was driving with an injury, but it was good enough to beat the Crash Bandicoots and move onto the semi finals. The 2 man Japspeed team were facing the tire changing extraordinaries, Team Mint. 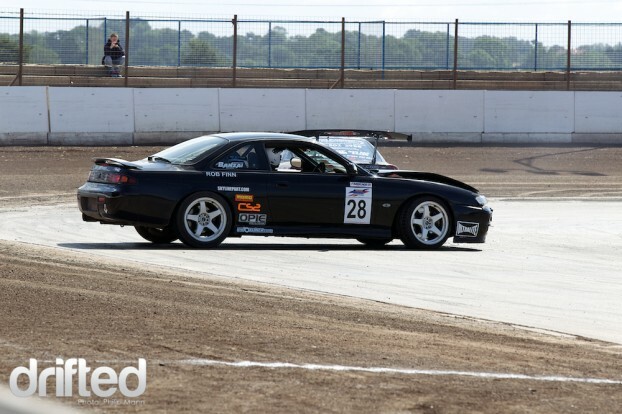 Wayne Keeber’s Toyota Soarer seemed to struggle to keep up with the 2 R32 skylines in the twisty middle section but could close the gap up once the track opened up. 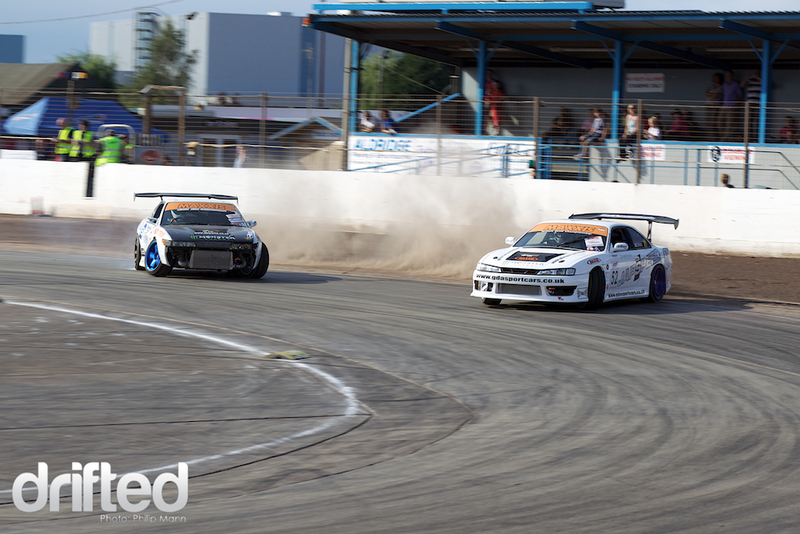 But the two cars of Team japspeed could not score higher than the 3 car Team Mint. 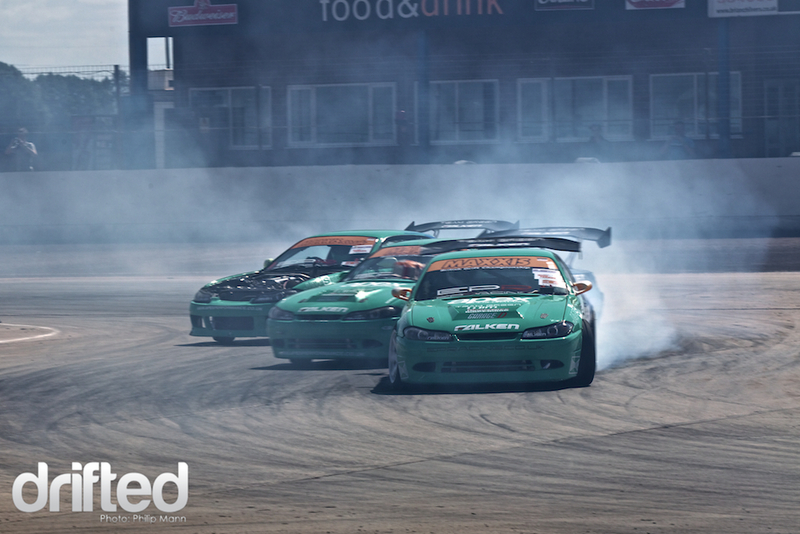 It was extremely close drifting for Team japspeed in their battle against Team Green/Falken. Nathan Chivers and Anthony Cahill got so close that Anthony’s front tow hook sliced a clean line through the bottom of Nathan’s bumper. When they parked up both drivers jumped out to survey the damage but couldn’t believe how close they got without crashing. 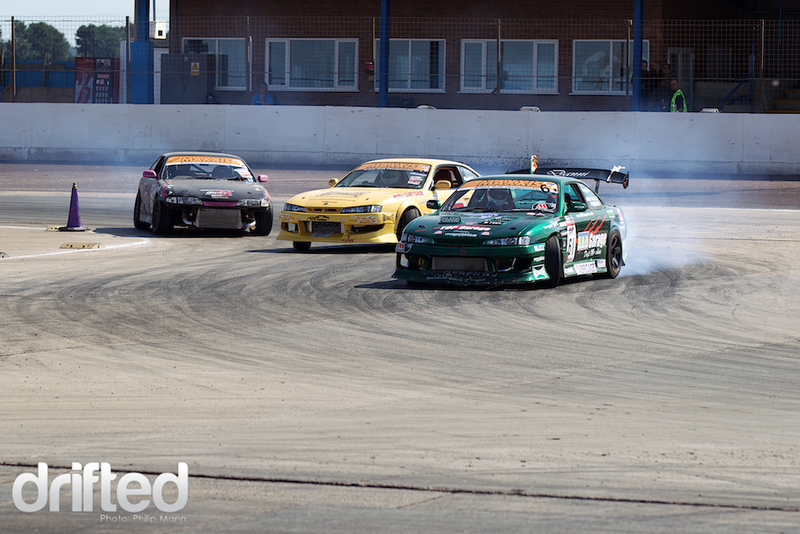 Team Green/Falken continued their 2 man drifting show and out scoring the 2 Japspeed drivers on both runs. It was a shame Alan’s turbo died as i’m sure they would of won if they had all 3 cars running. 3 R33’s, 2 R32’s and one Toyota were the cars that would make up the final. 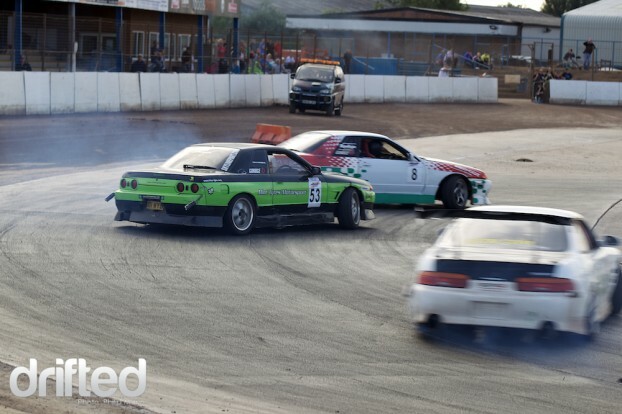 The 2 Team Mint Skyline’s were very close during their runs with the Soarer lagging behind slightly on both runs. 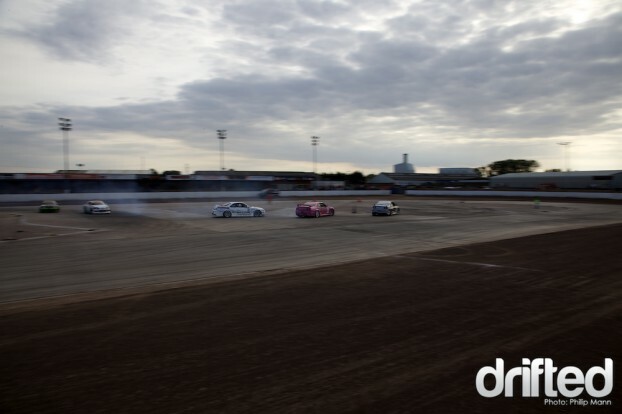 But it would be Team skyline Owners.com that would be victorious. Keith Hammond was setting the pace for Simon Perry and Ian Phillips. On the first corner Keith was a little bit ahead of the other two, but they upped their pace to close the gap. Their runs looked great and they deservedly took the win. Before we went to the podium we were treated to 6 car drifting with Team Mint and Skyline Owners. It was a fantastic sight to witness. Hopefully we can get more drivers and spectators to next years BDC weekender, as i said in my previous report i witnessed some of the best UK drifting ever at this event. 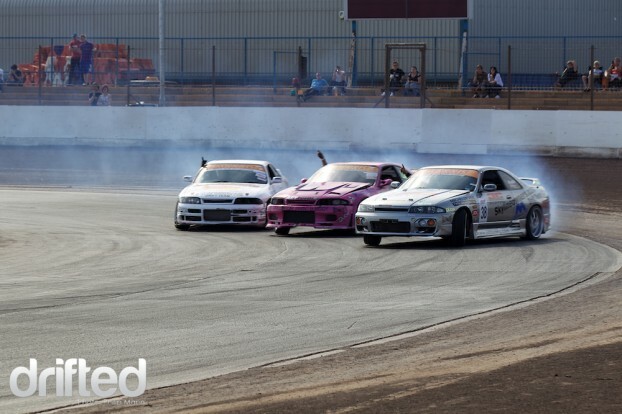 And keep a look out for some posts from Will Epps and Ian Gratton as they hit up Mallory Park on August 24th for some full circuit drift action.